Some people call it “workplace 3.0” – the rapidly changing nature of today’s business environment to a more mobile, task-based based workforce. With the use of outsourced labor and contractors on the rise, and the growth of telecommuting and digital connectivity among employees, defining your traditional workday may be becoming increasingly difficult. As compliance with federal and state wage and hour laws becomes more complicated, the plaintiffs’ employment bar has learned just how lucrative class and collective action litigation can be. 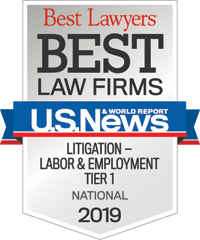 This litigation is unique because it often incorporates both federal and state claims in the same cause of action, and requires defense counsel skilled and knowledgeable in the specific intricacies of wage and hour law. This is also an area that is excluded under most employment practice liability policies, so for most employers, back wage exposure and all of its associated costs continues to be an uninsured risk. Because there is no preemption of state law by federal wage and hour laws, employers covered by both must take steps to ensure compliance with whichever law imposes the greater obligation on the employer. This meshing of federal and state wage and hour laws can be particularly burdensome for employers with multi-state operations. Constangy’s wage and hour team can help you navigate this difficult landscape. The attorneys on Constangy’s wage and hour compliance team have substantial experience in all areas of the federal Fair Labor Standards Act and state wage and hour laws, some having come to the firm from positions within the U.S. Department of Labor and various state agencies. You could even say that Constangy “wrote the book” on wage hour compliance – practice co-chair Ellen Kearns is the Editor-in-Chief of the American Bar Association’s highly respected treatise on the FLSA. We are skilled at handling some of the more complex wage and hour issues of recent vintage, such as recordkeeping for telecommuting employees and the exemption status of jobs that have become much less "discretionary" because of technology. We also understand modern-day compliance with the overtime requirements for non-exempt employees paid under various incentive compensation arrangements. Our attorneys have successfully defended numerous class and collective actions brought under both federal and state wage and hour laws. We also know how to help you minimize risk and reduce potential liability by offering policy development and training to help ensure and maintain compliance. Our experience is not just limited to the trial court level. Our attorneys have handled appeals of both wage and hour and other types of employment claims in both federal and state courts of appeals, including various stages of the appellate process. In addition, the firm’s creative approaches in working with federal and state regulatory agencies to assure the government of prospective compliance with wage and hour requirements has helped many clients avoid potentially major liabilities. Defeated class certification effort in a statewide wage and hour case involving allegations of off-clock work by a chain retailer, and settled remaining claims of named plaintiffs on favorable terms. Convinced plaintiff's counsel to dismiss an FLSA collective action with prejudice after refuting liability with employer's payroll records. Prevailed in obtaining a court order compelling arbitration of FLSA collective action, and then settled the claim of the named plaintiff and obtained dismissal of a collective action. Disposed of class action wage and hour claims in arbitration proceedings by satisfying the single-named plaintiff's claim and moving for dismissal of cases. Compelled single claimant arbitration where arbitration agreements were silent as to availability of class and collective procedures. Crafted and obtained confidential court approval of claims-made reversionary class action settlement where only filing claimants shared in settlement and all funds designated for non-claimant class members reverted to defendant. Is Wage and Hour’s new PAID program a “win-win”? That remains to be seen. COUNTING THE COST OF PAYROLL CARDS: Are They Worth It for Employers? Webinar - FLSA OVERTIME COUNTDOWN! December 1 is only a month away. Are you ready? WEBINAR - FLSA White Collar Exemptions: Is It Time to Reevaluate Your Classifications? Webinar Recording - FLSA White Collar Exemptions: Is It Time to Reevaluate Your Classifications?